The bicycle shop and associated One Fam event space are being evicted following a messy landlord divorce. Tony Coleman said he was surprised when sheriff’s deputies showed up last month to lock him out of his business. Back in mid-2009, Tony Coleman was trying to find a way to create a lasting positive force from the rebellious energy unleashed by the Oscar Grant rebellion. Thousands of Oakland youth had marched in the city's streets demanding justice for Grant, who was shot and killed by BART Police Officer Johannes Mehserle on New Year's Day that year. The uprising forced the district attorney to put the officer on trial. Coleman, who had offered his house as an organizing hub for the movement, latched onto a simple idea in order to channel some of the momentum into a long-term project. He organized a bike ride from Lake Merritt to DeFremery Park, in the name of justice for Oscar Grant, and also as a show of Black-Brown solidarity. That mid-summer bike ride drew hundreds of participants, mainly youth of color from Oakland's flatlands cruising BMXs and scrapers. Following that success, Coleman rented a storefront on the corner of Seventh and Peralta streets in the Lower Bottoms neighborhood from married couple Lucy Lequin and Arnold Fields. The long-neglected corner quickly sprang to life as a bike shop. But it was a bike shop with a mission. "It's more than a bike shop, it's a place where we build," Coleman said in a 2010 video about the budding project. "It just so happens bikes are one of the things we're able to do to become more self-sustainable. We're able to have a green business to fund the activities we want to do in the community." That's how Bikes4Life was born. For the past nine years, the nonprofit served as a drop-in bicycle kitchen, community organizing space, and environmental education center. And the annual bike rallies continued to grow each year, too. In time, Coleman also leased an adjoining storefront from Lequin and Fields and built it out into an event space called One Fam. It plays host to concerts, dances, and other performances. Then three years ago, Coleman took over the Revolution Cafe on the same block owned by the same landlords. But now, Bikes4Life is threatened with eviction. The cafe is already padlocked, and Coleman's hard-won foothold for youth of color in West Oakland, the city's most rapidly gentrifying neighborhood, is slipping away. Coleman readily admits that the eviction is partly a result of his falling behind on rent. "I bit off more than I could chew," he said in a recent interview, referring to his takeover of Revolution Cafe in 2015, which unlike the bike shop and One Fam space, hasn't ever been financially self-sustaining. But Coleman said that another factor is also partly to blame for Bike4Life's impending closure — his landlords' messy divorce. 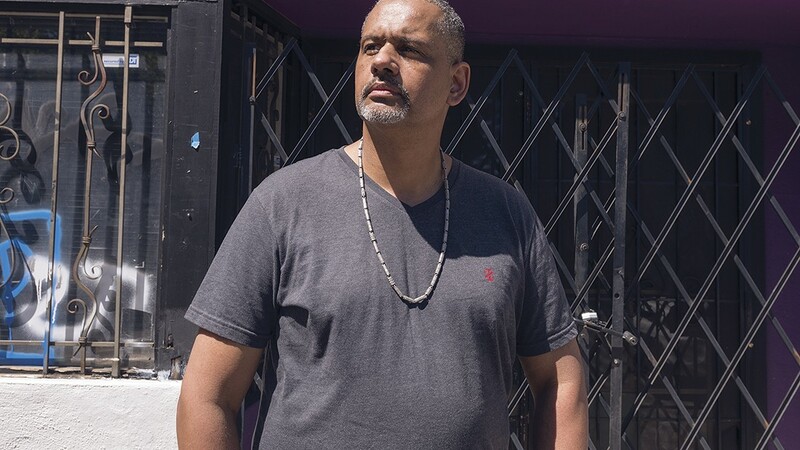 Furthermore, he claims that he didn't get a chance to plead his case in court after the eviction lawsuit was filed against him earlier this year. Instead, it took him by surprise when sheriff's deputies showed up last month with Fields to lock him out. He blames it on the way the eviction lawsuit was served to him, which he claims was improper and didn't inform him of the court date with enough time to prepare a defense. As a result, he didn't appear in court and the judge entered a default judgement was entered against him. How it all came to this, according to Coleman, is that for years married couple Lequin and Fields co-owned and operated the properties and leased the bike shop space to him for a cheap price. He had very few problems with his landlords. Fields, an eccentric real estate broker who ran for mayor in 2010 as a socially liberal pro-business Republican, ended up running Revolution Cafe as a second job. Lequin, an artist, had the goal of turning the entire block into a historic district and revitalizing the area. But at some point, the husband and wife apparently became alienated from each other. Fields gave up running the cafe. Lequin moved out of Oakland. They separated, and then Lequin filed for a dissolution of the marriage. Finally, last year, Coleman said that both Lequin and Fields more or less disappeared. Meanwhile, problems with the old buildings kept popping up, and Coleman said he had no one he could turn to for repairs. One issue was a leaking roof in the cafe. Coleman claims that he put as much as $15,000 of work into the buildings in order to keep the water out. And Coleman said he also started paying for trash services. During this time, he fell behind on some of the rent owed for Revolution Cafe. Then in February of this year, Fields came back in the picture. According to Coleman, Fields showed up one day and demanded unpaid rent for the cafe going back into 2017. The total amount is $7,300, according to Coleman. But Coleman believes that if Lequin were still his landlord, she would have worked with him. They could haggle about how to pay the rent and he'd be able to make his case for accounting for any money his organizations might have put into the building over the past year. "The property is now Arnie's responsibility," Lequin wrote in a brief email to the Express about the eviction. "It's no longer my problem." Lequin did not respond to a follow-up email seeking more information. Fields didn't respond to emails and phone calls seeking his version of the story. But Cafe Revolution appears to have a history of losing money and causing problems for its owners, no matter who is operating it. In fact, Fields appears to have run into financial difficulties in the years when he ran the cafe. He also violated labor laws by not paying one of his employees. In 2017, the state Employment Development Department filed a $63,457 tax lien against Fields for unpaid payroll taxes between 2012 and 2015 for the cafe. And Fields also owed wages to a former employee, Nicholas Wortham. Wortham filed a complaint with state labor investigators in 2014 alleging that Fields failed to pay him for numerous hours worked the previous year. He was awarded $3,074 by the state Labor Commissioner. Fields paid Wortham back in 2016, according to public records. When Lequin filed for divorce from Fields in September 2015, at stake were 18 different properties — 13 of them located in Oakland — worth millions of dollars that the couple owned together. Who would take control of these properties appears to have been an acrimonious question. In July 2017, Fields even attempted to grant ownership of seven of the couple's Oakland properties over to his parents, but a judge later ruled these actions invalid and awarded the properties to Lequin as part of the divorce settlement. The judge also ordered Fields to stay 100 yards away from these properties and enjoined him from collecting any rents from them. But consequentially, Fields was awarded full control of the buildings that house the cafe, bike shop, and event space. Julian Park, a friend who is working with Coleman to stop the eviction of Bikes4Life, said they were able to obtain a short stay of execution to stop the eviction of the bike shop and One Fam space, and that they're now trying to go back to court and re-argue the eviction lawsuit. Supporters of Bikes4Life say its displacement would be a major blow to the Lower Bottoms, one of Oakland's most rapidly gentrifying neighborhoods where cheap commercial spaces are increasingly hard to find and homes are now selling for $800,000 and up. "The idea that it would be taken away is not just a blow to the business of Bikes4Life or Revolution Cafe, it's a blow to the community considering how violent gentrification is," said Senay Dennis, an artist who also organizes Oakland's Red Bike and Green chapter, a Black bicycling club. Two months ago, Dennis helped complete a mural of Major Marshal Taylor, the pathbreaking Black cyclist who became world champion in 1899, on the wall of Bikes4Life. "It's not just that they're trying to take something away from Tony, they're taking away something away from all of us," said Dennis. Coleman said he just wants a chance to negotiate to keep the bike shop and One Fam event space, and to turn the cafe over to a different tenant who can perhaps turn a profit there. In the meantime, he's trying to raise rent money through an Indiegogo campaign. But even if he loses the space, Coleman said he plans to continue operating Bikes4Life in the Lower Bottoms. "It's still our village," said Coleman. "We still all live here."